Situated 1 km north-east of Chaudi in Canacona, Chapoli Dam is located in a scenic spot extending westward from the Sahyadris. It makes it an excellent spot to take a break as it lies deep in the valley between hills. Chapoli lies deep in the valley between hills, which makes this wonderful nature’s gift a great place for relaxing and very convenient for excursions for tourists. Take a taxi from Agonda. How popular is Chapoli Dam? 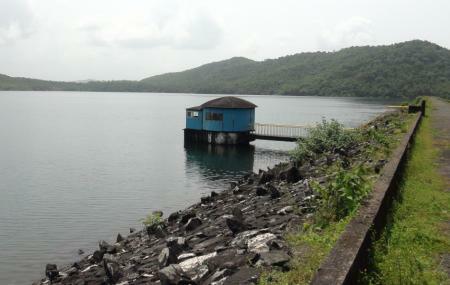 People normally club together Rock Formations and Shiva Yoga Centre while planning their visit to Chapoli Dam. Very far from market, no public transportation. But the scenery on the way and final destination is awesome. Advised come back before 7:00 pm. Nice place to go for a evening walk or ride. Water alongside greenery. In monsoons when it is overflowing, it's a good sight. It is free kilometres away from NH-17. A very peaceful place to relax. As there are no shelters over here, do take an umbrella or apply sunscreen to avoid tanning. The roads leading to the Chopoli dam after getting off NH-17 is not properly maintained. Most parts of the roads is good, except for a small stretch which has been been worn out because of recent rains. No people will be visible over here, so come during bright day light so that you don't get robbed. Take care of your own safety over here. The view of the dam is not breathtaking, but it still has the charm to impress you.